Welcome to the University of Iowa Perfusion Technology Education Program. If you are considering a career in a medically related field, perfusion is one exciting option that is not widely known or advertised. A perfusionist is a highly trained, technology driven healthcare specialist that directly impacts the welfare of patients receiving cardiothoracic and transplant procedures. Our primary task is to operate the heart-lung machine, which keeps patients alive during open heart surgery. This exciting career choice commands an individual that is creative, technologically adept and able to think critically and perform tasks under great amounts of pressure. 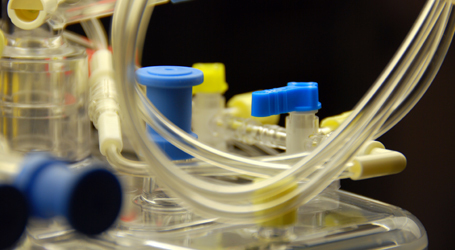 The Perfusion Technology Education Program at The University of Iowa is a post baccalaureate 20-month program (five semesters) and awards a certificate upon completion. We are accredited by the Commission on Accreditation of Allied Health Education Programs upon the recommendation of The Accreditation Committee for Perfusion Education (AC-PE) . Graduates are eligible to take the basic science and clinical applications American Board of Cardiovascular Perfusion certification exams which certifies them to work as clinical perfusionists. Three to five students are accepted annually and begin the program in the fall semester. Admission to the program is by approval from the Admissions Committee, who will make their decision based on a combination of GPA, reference, essay, and interview scores. During the first two semesters of the program a challenging core curriculum provides a solid scientific base while the second year (three semesters) is reserved for the completion of an independent research project, rigorous clinical training in the operation of the heart-lung machine and learning ancillary procedures such as blood salvaging, circulatory support and artificial hearts. With advancing technologies the role of a perfusionist is constantly evolving and our curriculum complements this. On this website you will find information on our perfusion program, an application form that can be filled out and emailed, and reference forms. There is also information on program prerequisites, curriculum, finances, and the admission process. Applications must be submitted by December 1 for early admission consideration. All applications after this date will be processed on a space-available basis. If after reading through our web content you still have any questions, please feel free to contact Jean Fobian jean-fobian@uiowa.edu and she will direct you to the right answers.